For better or worse, the United States Football League brought us football in the spring, challenge flags, and the two-point conversion after touchdown. At its launch in 1983, the league made a serious attempt to do something different and was able to exploit vulnerabilities in the relationship between the NFL and its players, as evidenced by its shocking the football establishment in signing three straight Heisman Trophy winners. There were also the young stars who emerged—Reggie White, Steve Young, Herschel Walker, Sam Mills, and especially Jim Kelly and the insane offensive juggernaut of Mouse Davis’s Houston Gamblers. 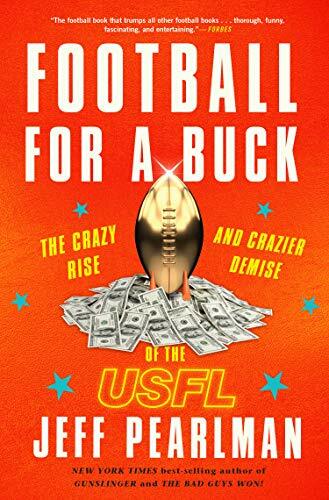 Jeff Pearlman brings this small slice of football history to the printed page in his wonderfully engaging book, Football for a Buck: The Crazy Rise and Crazier Demise of the USFL. It is clear from the outset that one would be hard-pressed to find anyone who loved the United States Football League to a greater degree than Pearlman. From the book’s opening, where he recounts talking a high school teacher into letting him write a term paper on the extinct football league, the bestselling author is obviously pursuing a labor of love and having a great time taking us along on his ride. Pearlman reveals that the genesis of the USFL came more than two decades prior to its ultimate founding, in 1961, when New Orleans antique dealer David Dixon came up with the idea of a professional football league that would play in the spring. Dixon initially reasoned that he could pose a threat to the NFL and force its owners to move a franchise to his city. He pitched the idea to no less a legend than former Cleveland Browns coach Paul Brown, who told Dixon spring football was a great idea and that he should act on it. Dixon was finally ready to move forward in 1966, but the AFL and NFL merged, and the NFL placed an expansion team in New Orleans. So the idea was put on hold. Dixon revived his idea in the late 1970s, this time pitching it to former Rams and Redskins head coach George Allen, whose enthusiasm for the concept rivaled Paul Brown’s. By that time ESPN had been established and a coming explosion in sports viewing options was on the horizon thanks to the emergence of cable television, expanding a medium increasingly hungry to fill its insatiable appetite for content. The strength of Pearlman’s book is grounded in the stories of the league, especially its dual portrayal of impressive young talents and those on the fringe both athletically and personally, using the league to hang on to the dream just a little longer. The latter category memorably includes defensive lineman Greg Fields—a man who did not take news of being cut from a roster particularly well. One of the book’s highlights involves Pearlman’s present-day efforts at tracking down the notoriously violent Fields in order to provide an epilogue to his career. Along the way Pearlman repeatedly skewers owners and coaches, including legendary coach George Allen and perpetually unhinged Los Angeles Express owner William Oldenburg. The relationship—or better put, lack of same—between Bassett and Trump was one of the league’s key dynamics, and probably deserved greater prominence here, although there is a wonderful inclusion of a letter from Bassett to Trump on Bandits letterhead, with Bassett threatening to punch Trump the next time he badmouthed commissioner Chet Simmons or other owners. Pearlman places responsibility for the league’s demise squarely on the shoulders of Donald Trump, who rejected initial overtures to join the USFL, only to purchase the New Jersey Generals before the league’s second campaign. Initially seen as the league’s savior, taking over a foundering franchise in the country’s largest market, it soon became apparent that Trump was more interested in pursuing his own strategy to gain entry into the NFL, despite Commissioner Pete Rozelle’s absolute and unwavering determination that the young Manhattan real estate developer would never be allowed to join. Readers who are fans of Donald Trump may take offense at Pearlman’s frequent attempts to show negative parallels between Trump’s actions as an owner and his current role as president, but it would be impossible to portray the USFL without addressing Trump’s personality and self-serving strategy that ultimately doomed the league. Those who are foes of Trump will not be surprised. Pearlman does an outstanding job with the trial and the resulting verdict that led to the book’s title, detailing the legal strategy employed by both sides and taking us into jury deliberations without bogging down in legal minutiae. He has a great feel for people and writes with a great sense of humor, both of which are particular strengths of the book. Football for a Buck is a fascinating, entertaining and fast read. Pearlman wisely stays away from game-by-game recounts, focusing instead on personalities and events that defined the league’s short history. His approach is reminiscent of Terry Pluto’s Loose Balls, about the American Basketball Association. Like Pluto, whose work Pearlman admires and wisely used as a model, Pearlman weaves the narrative around a never-ending cast of colorful players and owners, and devotes many of the chapters to different franchises—one of the most entertaining sections regards the crazy shoestring existence of the San Antonio Gunslingers and their three-fingered, dementia-addled head coach. It might have been nice to add more of a coda to the league, its players, and the impact the USFL has had on the professional football landscape. The ending of the book seems abrupt. But sadly, so was the league’s end. It is wonderful to read about the USFL from the standpoint of someone who cared about it, understood it, and mourns its loss. Sports author Dennis Snelling is a three-time finalist for the Casey Award for Best Baseball Book of the year, including for his most recent title, Lefty O'Doul: Baseball's Forgotten Ambassador.